Times: Advance booking and payment is essential. Sorry no refunds. Capacity: Spaces are strictly limited to 6 - 8 people per session. This means, I must request a level of commitment from anyone considering attending my classes. I have taught in all sorts of Educational colleges, Institutes, Mind, Scope community and day centres, as Artist in Residence, at a Buddhist Centre, schools, after school programmes and classes in my own studio and generally to people from all "walks of life" for over 20 years. Clay attracts and applies a form of therapy, compelling people to caress it. It drives a compulsion that seems to form a sort of addiction; Mother Earth the healer. 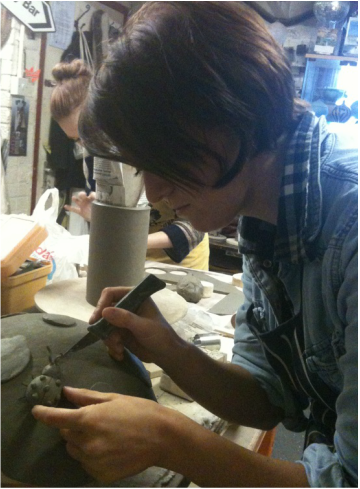 The "student" becomes emotionally involved with the clay, forming a bond and empathy with their work, it is an extension of their own persona/selves--their "child". I firmly believe that in this climate of cutbacks and financial insecurity, Ceramic and Pottery courses in education and general, supply an invaluable resource, aiding positive Mental health and self belief, restoring confidence and promoting self worth and purpose to life. It serves the NHS without acknowledgement; the quiet and unsung therapist and healer. As a Ceramic Tutor, I am also a therapist, counsellor, healer and a supplier, enabling the "potential to create" to exist. Speaking as a technician, I provide the "power" to immortalise the students creations, by firing the work and providing the tools and equipment to allow this creativity to flow, grow and exist. I feel privileged to have been able to pass on my skills to hundreds of students over the years, to keep the art and craft of Ceramics alive.